Welcome to yet another weekly recap on your favorite Stardoll blog. I wish I could tell you week was full of great updates and releases. Sorry to disappoint you, but it was pretty average week. Still, we can always hope for better next one. Until it, read my recap to see what you missed, or just want to see most important events and releases in one extensive post. On Monday, Stardoll released a new floor in Furry Friends store. The store consists of many various pets, some in interesting poses. The pets are adorable, of course, especially cats, who will go to my 'crazy cat lady' room. Background and other furniture is also nice, though there isn't much interior beside pets. I like they added some other pets besides cats and dogs. like Fennec, Skunk and even the Possum, (which was initially released in starcoins, a glitch or so - we haven't had those 'glitches' much recently). Anyway, even if you don't like buying interior, those cute animals will look cute in almost any room. On Tuesday, Stardoll announced a 50% off closing sale on selected items in selected stores. Yeah, another sale like we had a while ago. (Except those were 60% off, which turned out to 75% the last day), I am really loving the design of the advertisement, so unique and attractive. Still, I wasn't a huge fan of a sale. It may be just me, but I just prefer other stores. I did not even visit Mr, most Evil panda stuff I wanted to buy I had already, and Original future has too many too bright clothes. But of course, I bought a nice amount of stuff. Not everything I planned to, as I expected 75% off sale, which we, unfortunately, never got. On Wednesday, Stardoll released their 2nd collection of Bird's Eye store. The concept for store remains the same - full of items that, when put in a room, make it look like your room is being seen from above. This collection's theme is Picnic, we have some nice blankets, pillows, barbecue, food plates, some cute boys (well at least they seem so as we cannot see their faces). I really love the idea behind this store, especially as we can design a specific look for each room. And this collection is even better than the 1st one. I wouldn't mind more collections, but please, Stardoll, give us more 'ordinary rooms'. Pretty please. 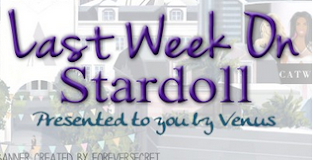 On Thursday, Stardoll announced next month's Hot Buys. Unlike previous black and white collection (from which I bought almost everything as I promised), this one is full of colors. Color blue and sparkles dominate in collection, with some colorful pieces as well. It is really nice, I love the blue flower and the dress on the top left. Yeah, and the denim jacket as well, you know I love denim. I actually like that they added some color to this collection, Summer won't last forever and we need o enjoy it while it lasts, even on Stardoll. And on Friday, we got another 'ordinary' release - this time in Rio store. The overall color theme is black and gold, with some blue and grey tones and sparkles. I love the black jumpsuit, gold sparkly top, and accessories are just perfect. As I have seen in comments, you have found a lot of ways to style those items, even they seemed kinda hard to style to me. Since it is ordinary, non limited collection, I think I will wait a little before buying anything. And that's it for the week! Yup, also Subcouture is leaving plaza, and we can expect new Dot collection, most likely tomorrow. Until then, vote, comment, and see you next week.